When you get a chance, please vote for the movie ONE ANGRY JUROR (in which Aaron plays District Attorney Frank Riley) in the ‘Lifetime Movie of the Year 2010 poll’. The Lifetime tv movie ONE ANGRY JUROR (in which Aaron plays District Attorney Frank Riley) is available to purchase for USD $24.95 (plus shipping) from the Lifetime website. For those of you outside of the USA, they will ship overseas. If you are in the USA, you can watch the tv movie ONE ANGRY JUROR (in which Aaron plays District Attorney Frank Riley) online at the LIFETIME website. Aaron is on screen at time stamp 01:24 – 01:28. Based on a true story. The story of Chicago attorney Sarah Walsh, who was chosen to serve on the jury of a murder trial and was convinced that the defendant was innocent. UPDATE (October 4, 2010): The schedule on the Lifetime website has been updated and on Monday Nov 8th there’s ‘Baby For Sale’ on LIFETIME and ‘Black Widower’ and ‘Christie’s Revenge’ on LMN. The schedule stops at Sun Nov 14th so I’ll check back next week to see if it’s listed. 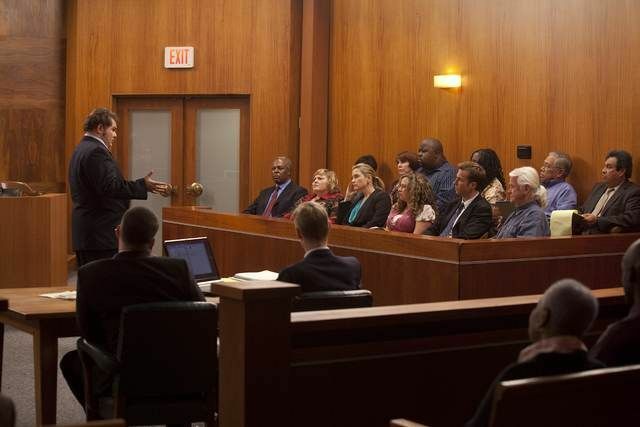 TV.com have posted six promo photos from the LIFETIME MOW ONE ANGRY JUROR. The photos are of actress Jessica Capshaw but this image shows the back of Aaron’s head. If they are releasing photos, hopefully we are getting close to having a date on when it will air. Fingers crossed.